Royals pitcher James Shields is Sunday's Player of the Day, while Dodgers pitcher Zack Greinke rises to third place in Box-Toppers player rankings. Shields pitched seven shutout innings and struck out nine in the 5-0 win over the Blue Jays. Greinke, National League Player of the Day, moves to third place in Box-Toppers player rankings for the season (see the updated top 10 list on the home page). Greinke gave up one run and two hits over seven innings and struck out seven in the 2-1 win over the Padres. Greinke earns 1.7 Box-Toppers points for being NL Player of the Day, giving him 17.4 for the season. Michael Cuddyer of the Rockies is NL Batter of the Day. Cuddyer homered, drove in three runs and went 4-for-4 in the 7-4 win over the Reds. Cuddyer earns 1.5 Box-Toppers points for being NL Batter of the Day, giving him 10.0 points for the season, rising to 38th place among players for the season. David Ortiz of the Red Sox is American League Batter of the Day. Ortiz drove in three runs and went 2-for-3 in the 7-6 win over the White Sox. 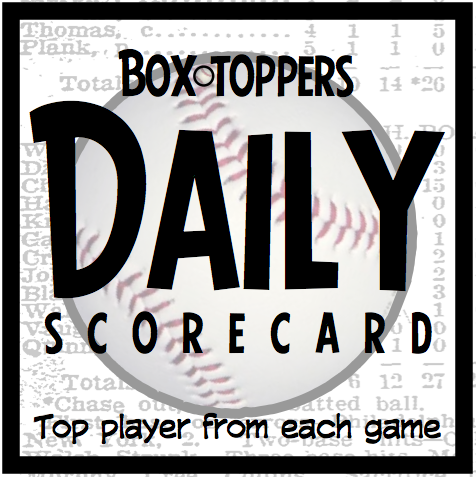 Ortiz earns 1.5 Box-Toppers points for being AL Batter of the Day, giving him 10.7 points for the season, rising to 30th place among players for the season. Shields receives 2.0 Box-Toppers points for being Player of the Day. Greinke receives 1.7 for NL Player of the Day. Cuddyer and Ortiz each receive 1.5 for being top Batter of the Day in their league.